African countries have launched African Forest Landscape Restoration Initiative (AFR100), a Pan-African, country-led effort to restore 100 million hectares of degraded and deforested landscapes by 2030. 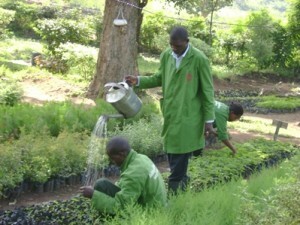 The AFR100 target of 100 million hectares has been endorsed by the African Union. So far 10 African countries have agreed to join AFR100 and committed at least 31.7 million hectares of land for forest landscape restoration. AFR100 partners are earmarking more than USD $1 billion in development finance and more than $540 million in private sector impact investment to support restoration activities. The Countries that have agreed to join the AFR100 initiative include Democratic Republic of Congo, Ethiopia, Kenya, Liberia, Madagascar, Malawi, Niger, Rwanda, Togo and Uganda. The announcement was made during the Global Landscapes Forum at the Conference of Parties (COP21) in Paris, where forest landscape restoration is a key ingredient of the global movement to adapt to and mitigate climate change. Commitments made through AFR100 build on significant climate pledges made by many African countries to support a binding global climate agreement. “Restoring our landscapes brings prosperity, security and opportunity,” said Dr Vincent Biruta, Minister of Natural Resources in Rwanda. “With forest landscape restoration we’ve seen agricultural yields rise and farmers in our rural communities diversify their livelihoods and improve their well-being. Forest landscape restoration is not just an environmental strategy, it is an economic and social development strategy as well,” he added. For the first time, AFR100 brings together political leadership with an ambitious package of financial and technical resources to support a large-scale forest landscape restoration effort across Africa. Nine financial partners and 10 technical assistance providers have pledged support, led by the New Partnership for Africa’s Development (NEPAD Agency), Germany’s Federal Ministry for Economic Cooperation and Development (BMZ), and World Resources Institute (WRI). So far, AFR100 partners have set forth over USD $1 billion of development financing. In addition to new financing, a coalition of organizations will provide technical assistance on a wide range of activities, including the mapping of restoration opportunities, securing further financing, and implementing restoration efforts on the ground. Partners include World Resources Institute (WRI), Clinton Foundation, Food and Agriculture Organization of the United Nations (FAO), International Union for Conservation of Nature (IUCN), Jane Goodall Institute (JGI), Kijani, New Partnership for Africa’s Development (NEPAD Agency), The Landscapes for People, Food and Nature Initiative (LPFN), and The Nature Conservancy (TNC).